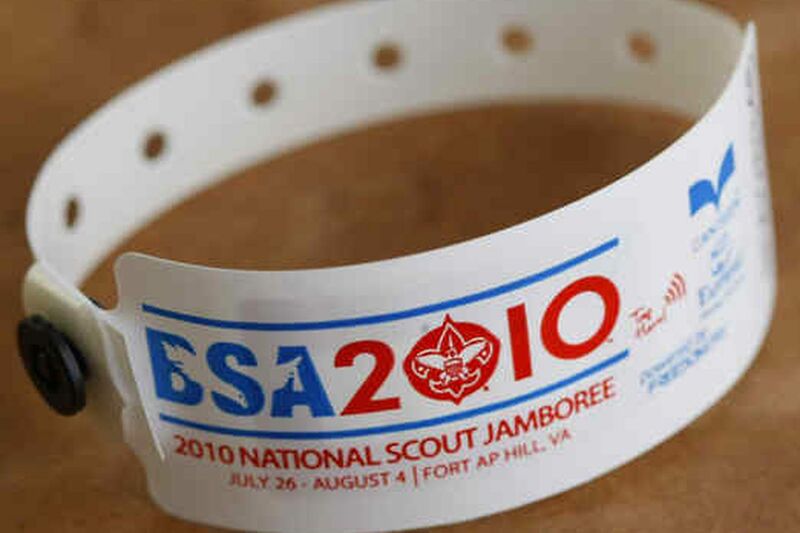 A plastic band with an RFID tag will let scouts pay for things electronically at the National Scout Jamboree in Virginia. For Radnor-based FreedomPay Inc., the National Scout Jamboree that begins later this month will be an interesting test of its electronic payment system. After all, what do you think can happen when you cram about 40,000 Boy Scouts into Fort A.P. Hill in rural Virginia for 10 days and they all want to buy something at the trading post? Scouts may be taught to be honest and trustworthy among other qualities, but they're also tweens and teens, and that means they can be forgetful and lose things. Like their money. So the 100-year-old Boy Scouts of America and 10-year-old FreedomPay came up with the Smart Bracelet that will allow parents to fund an electronic account, instead of sending 50 bucks or a credit card with their camper. The plastic Smart Bracelet snaps onto the wrist like a hospital bracelet or those Tyvek strips used at some theme parks. The big difference is FreedomPay's version has a radio-frequency identification tag that communicates with an electronic reader to debit a secure account when that craving for an ice cream cone hits. That convenience comes at a cost: a $6 administration fee when parents start the account and an additional 4.25 percent of the fund amount that the company says covers the cost of the electronic funding. FreedomPay estimates it will cost $10 to $15 to set up and fund an account. The minimum amount for an account is $50. On its Jamboree website, the scouting group recommends parents budget about $10 to $20 per day per Scout. Here's some scary math: $10 times 10 days times 40,000 Scouts. That's $4 million available to spend on concessions! I thought a Scout was also supposed to be thrifty? For FreedomPay, the Jamboree is another way to demonstrate how its FreeWay transaction gateway can be customized for various uses, said Sam Bellamy, its chief operating officer. Hospitals, such as the Robert Wood Johnson University Hospital in New Brunswick, N.J., and Virtua, the Marlton-based health system, use FreedomPay's system for its staff to pay for meals in hospital cafeterias. FreedomPay has been positioning its FreeWay Software as a Service system as a way for manufacturers to track inventory and validate promotions through their often-complex supply chains, Bellamy said. The company said it had 1,000 clients using FreeWay. Bellamy would not disclose the private company's annual sales. The venture-backed company raised $2.17 million from its investors in its most recent equity financing in 2008, according to a filing with the Securities and Exchange Commission. FreedomPay's investors include Menlo Park, Calif.-based BlueRun Ventures (formerly known as Nokia Venture Partners), New York-based Goldman Sachs Group Inc., San Francisco-based Clarium Capital Management L.L.C., and Washington-based Core Capital Partners. FreedomPay, which moved from Newtown Square in March, employs about 40 people. "In my view, a strong sustainable U.S. economic expansion is not in the hands of the fates. It rests in our hands." - Kevin Warsh, a member of the board of governors of the Federal Reserve System in remarks in Atlanta on Monday.